What can architects learn from Walmart's fulfillment centers? - Archpaper.com What can architects learn from Walmart's fulfillment centers? 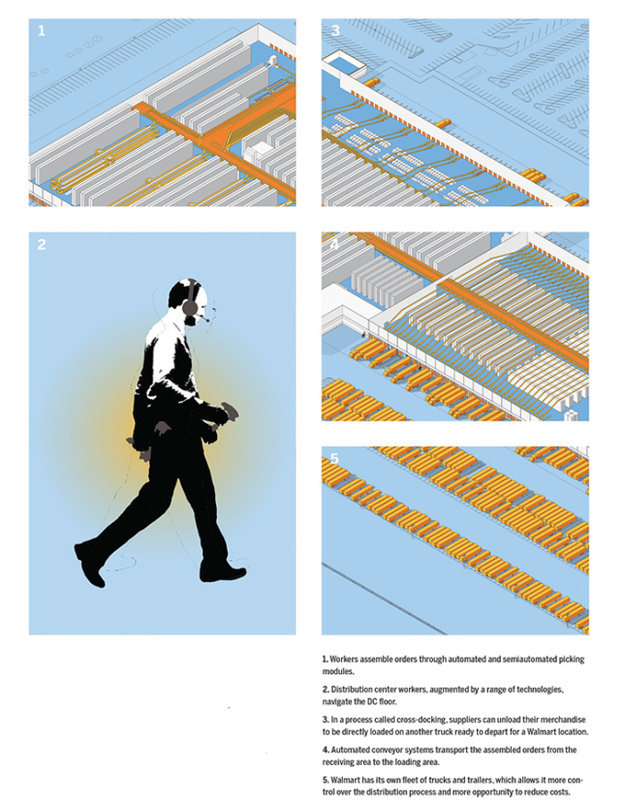 What can architects learn from Walmart’s fulfillment centers? Architects are fascinated with infrastructure, or better yet, anxious about it. Infrastructure is far larger and more pervasive, blanketing the earth with its concrete and asphalt, yet it also threatens architecture with irrelevance. Infrastructural architecture is dangerous: The ubiquitous big box that houses warehouses, distribution centers, data centers, and processing plants is optimized to the point that architects are excluded. Perhaps because of this, condition studies of the big box and its implications have been wanting. Jesse LeCavalier’s The Rule of Logistics: Walmart and the Architecture of Fulfillment helps fill the void. As the title makes clear, LeCavalier focuses on the world’s largest retailer, Walmart, and how its overarching obsession with optimizing logistics manifests itself in built form. For those interested in the dangerous encounter of architecture and infrastructure, the book is worth reading. While LeCavalier’s book is an academic study, it eschews the empty and abstruse theorizing that has marked such recent efforts, producing the best book on architecture and infrastructure of this decade. The book is composed of five chapters bracketed by an introduction and conclusion: “Logistics,” which delineates LeCavalier’s thesis, followed by “Buildings,” “Locations,” “Bodies,” and “Territory,” each of which explores how Walmart embodies logistics in a different condition. Logistics, LeCavalier argues, has taken over from mass production and become the new organizational paradigm for our age. Where mass production was formed around relatively stable, physical forms of organization, logistics is ever mutable and contingent, constantly responding to the conditions it encounters. The built products of logistics embody this condition, with the stability of carefully designed envelopes giving way to what he calls “a constantly transforming network of calibrated and interconnected interiors.” It’s this point that’s crucial to those of us hoping to understand the “big box.” This term “big box,” LeCavalier points out, belies the complexity of the horizontal surfaces of floorplate and roof, which gives the building its infrastructural capacity to optimize throughput, notably by eliminating as much of the back area of the store as possible. In opposition to any idea of architecture as autonomous form, the exterior adapts to make the store tolerable whatever the local condition. LeCavalier painstakingly details case studies of the negotiations Walmart makes with local planning authorities and the resulting effect on the (endlessly mutable) building envelopes of its stores. LeCavalier observes that, in a paradoxical twist, form and building envelope take precedence at Walmart’s data centers since the rapid rate of change of digital technology ensures that those buildings need to be planned before a final layout can be envisioned. But to talk of Walmart’s data centers as formally intended is itself a paradox: The goal of these structures is to disappear through camouflage. At times I wanted the book to be more architectural—to have larger illustrations and in color. Recently many of University of Minnesota’s publications have given the impression of being published on demand by Blurb or Lulu and the squat format and the quality of the cover underscores this. But ultimately this allows the book to be more manual-like, more like the precipitation of information from a manual of logistics into physical form and that fits the subject matter well, so I can’t complain. More disappointing is that the drawings by LeCavalier, one of our most accomplished draughtsmen, are small and hard to read, but again this seems a decision of the press rather than the author. Moreover, had the book been a glossy architectural publication, it might have compromised the argument. 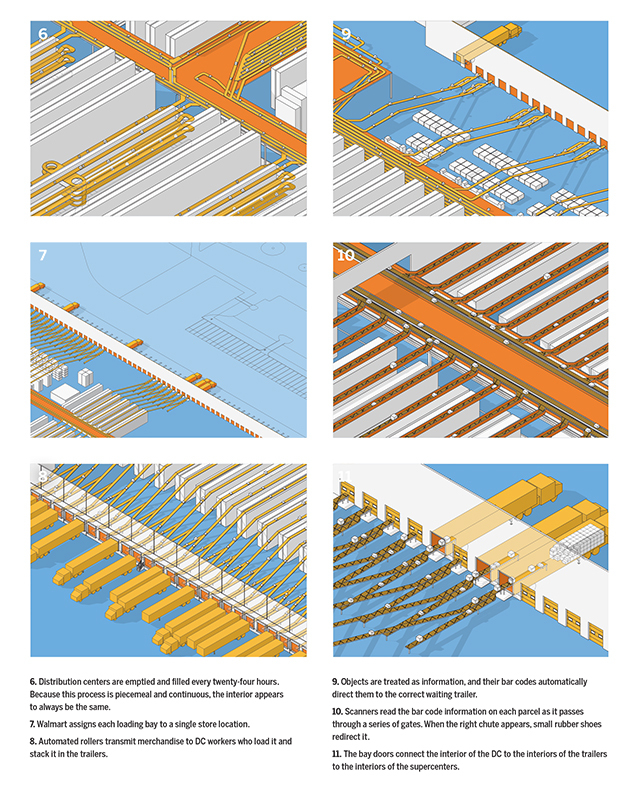 Still, I wished to see LeCavalier brilliant analytic axonometric drawings included in some form. Perhaps a future publication will follow containing more of these. The Rule of Logistics is an important book. For too long, what passes for the avant-garde has chased form for form’s sake, to embody the triumphant exuberance of the city and its neoliberal boosters. But last November, blue lost and red won, urban elites were undone by the heartland working class, the culture of Whole Foods shown up by that of Walmart. LeCavalier’s book, published some months before the election, underscores that the heartland is as permeated by the forces of the network as the urban center. The Rule of Logistics allows us to decode the spatial implications of this condition even as it suggests that architecture needs to learn from the architecture of the big box, much like it did from grain silos and factories in the early 20th century. Just as the election served as a wake-up call to well-intentioned urban liberals, The Rule of Logistics reminds architects that the most advanced work in the built domain is not in the city but in the sprawl outside it, that it’s not cool form but efficient logistical operations that pave the way to our future. Kazys Varnelis is the director of the Network Architecture Lab and cofounder of AUDC, as well as the author of several books about infrastructure and network culture.